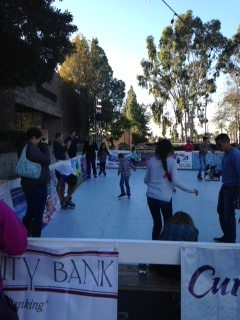 With colder than usual temperatures Redlands on Ice really felt like a winter wonderland in downtown Redlands. Hundreds of skaters, some first timers, some well-seasoned made their way to the synthetic rink to “give it a go” braving the cold. Skaters were treated to all the time they wanted on the rink honing their skills and finding their balance as they glided over the ice. Mayor Paul Foster, and President Elect Jill Riley, opened the rink officially 12:00 PM December 26th with the help of competitive figure skater Philip Warren. Warren dazzled those attending by demonstrating exactly what can be done including a breath taking back flip. For the next seven days adventure seekers of all ages tried their luck. Little children who have never had ice skates on before bravely headed out with arms and legs going in every direction but always a smile from ear to ear. Families hit the ice with the adults often times acting as support as the little ones rounded the rink slipping and sliding like their legs had been replaced by noodles. Even the senior set made an appearance reminiscing of days when ponds, lakes and backyard rinks beckoned. Without the extremely generous support of the rink sponsors it would have been impossible to bring the experience to Redlands. A very special thank you goes to The Rochford Foundation for acting as the presenting sponsor, the City of Redlands, Circa 2020 and Inland Presort and Mailing Services for their generosity.